TEAMS FROM THE NATIONAL WEATHER SERVICE OFFICE IN CALERA ARE STILL CONDUCTING GROUND AND AERIAL SURVEYS OF THE DAMAGE. THIS PRODUCT WILL CONTINUE TO BE UPDATED AS MORE INFORMATION BECOMES AVAILABLE. BEGINING IN THE EARLY MORNING HOURS OF MARCH 1, AND CONTINUING WELL INTO THE EVENING HOURS, THE NATIONAL WEATHER SERVICE IN BIRMINGHAM, ALABAMA ISSUED A TOTAL OF 95 WARNINGS CONSISTING OF SIX FLASH FLOOD WARNINGS, 38 SEVERE THUNDERSTORM WARNINGS, AND 51 TORNADO WARNINGS. IN ADDITION TO THESE WARNINGS...APPROXIMATELY 98 FOLLOW UP STATEMENTS WERE ISSUED BETWEEN 515 AM AND 1045 PM. MINOR FLOODING WAS REPORTED IN BOTH MONTGOMERY AND TUSCALOOSA COUNTIES AND RESULTED IN SEVERAL ROAD CLOSURES. THREE INCHES OF RAINFALL WAS MEASURED IN MONTGOMERY COUNTY. NON-TORNADIC WIND WAS BLAMED FOR DAMAGE IN ETOWAH, RUSSELL, TALLADEGA, TUSCALOOSA, SUMTER AND MONTGOMERY COUNTIES. A WIND GUST WAS ESTIMATED BY A TRAINED STORM SPOTTER IN THE SPRING VALLEY AREA OF MONTGOMERY COUNTY TO BE BETWEEN 60 AND 65 MPH. HAIL WAS ALSO ABUNDANT WITH NUMEROUS REPORTS OF 1 INCH AND SMALLER STONES ACROSS MUCH OF CENTRAL ALABAMA. THE LARGEST HAILSTONES REPORTED WERE 5 MILES NORTHEAST OF BESSEMER IN JEFFERSON COUNTY AND WERE APPROXIMATELY THE SIZE OF GOLFBALLS. THE NATIONAL WEATHER SERVICE OFFICE IN BIRMINGHAM RECEIVED NINE REPORTS OF FUNNEL CLOUDS FROM VARIOUS SOURCES ACROSS THE STATE. FAYETTE COUNTY (RATED AN EF0): A TORNADO TOUCHED DOWN 4 MILES NORTHEAST OF FAYETTE NEAR THE INTERSECTION OF COUNTY ROADS 18 AND 107. THE TORNADO TRACKED ABOUT ONE-QUARTER MILE AND WAS 50 YARDS AT ITS WIDEST POINT. THE MAXIMUM SUSTAINED WINDS WERE ESTIMATED AT 65 MPH. NUMEROUS TREES DOWN AND 3 HOMES WITH SHINGLE DAMAGE. A TORNADO WARNING WAS IN EFFECT FROM 248 PM CST VALID UNTIL 315 PM CST. FAYETTE COUNTY (RATED AN EF1): A TORNADO TOUCHED DOWN 4 MILES NORTHEAST OF HUBBERTVILLE NEAR COUNTY ROAD 43. THE TORNADO TRACK WAS 2.2 MILES LONG AND 150 YARDS AT ITS WIDEST POINT. THE MAXIMUM SUSTAINED WINDS WERE ESTIMATED AT 90 MPH. NUMEROUS TREES WERE BLOWN DOWN AND SNAPPED. THE TORNADO TOUCHED DOWN AT 310 PM CST. A TORNADO WARNING WAS IN EFFECT FROM 248 PM CST VALID UNTIL 315 PM CST. WINSTON/CULLMAN COUNTY (RATED AN EF2): A TORNADO TOUCHED DOWN IN THE ARLEY COMMUNITY. THE TORNADO TRACK WAS 6.2 MILES LONG AND 100 YARDS WIDE AT ITS WIDEST POINT. MAXIMUM SUSTAINED WINDS WERE ESTIMATED AT 110-115 MPH. SEVERAL HOUSES AND BARNS WERE DAMAGED. ONE CHICKEN HOUSE WAS COMPLETELY DESTROYED AND TWO OTHERS COLLAPSED. NUMEROUS TREES WERE UPROOTED AND SNAPPED. THE TORNADO TOUCHED DOWN AT 349 PM CST. A SEVERE THUNDERSTORM WARNING WAS IN EFFECT FROM 310 PM VALID UNTIL 345 PM CST. THIS WARNING WAS UPGRADED TO A TORNADO WARNING AT 318 PM CST AND WAS VALID UNTIL 400 PM CST. VALID UNTIL 315 PM CST. JEFFERSON COUNTY (RATED AN EF1): A TORNADO TOUCHED DOWN IN THE ADAMSVILLE COMMUNITY. THE TORNADO STARTED NEAR ABBEY ROAD AND AND TRACKED NORTHEASTWARD. THE TORNADO THEN LIFTED ABOUT 100 YARDS NORTH OF US HIGHWAY 78 NEAR SOLOMON STREET. DOZENS OF TREES WERE EITHER UPROOTED OR SNAPPED. MANY TREES FELL ON HOUSES AND CAUSED SIGNIFICANT DAMAGE. ONE HOME HAD A LARGE PORTION OF ITS ROOF LIFTED OFF. THE TORNADO PATH LENGTH WAS ABOUT 1 MILE LONG AND WAS 300 YARDS WIDE AT ITS WIDEST POINT. THE MAXIMUM WINDS WERE ESTIMATED AROUND 100 MPH. THE TORNADO WAS ON THE GROUND FROM 406 PM CST UNTIL 408 PM CST. A TORNADO WARNING WAS IN EFFECT FROM 313 PM CST VALID UNTIL 415 PM CST. SHELBY COUNTY (RATED AN EF1): A TORNADO TOUCHED DOWN JUST EAST OF COUNTY ROAD 17...ABOUT 6 MILES SOUTH OF ALABASTER. THE TORNADO TRAVELED EASTWARD FOR ABOUT 3/4 MILE AND WAS 100 YARDS WIDE AT ITS WIDEST POINT. MAXIMUM SUSTAINED WINDS WERE ESTIMATED AROUND 105 MPH. FIFTEEN LARGE PINE TREES WERE SNAPPED OFF ALONG THE PATH. THERE WAS MAJOR ROOF DAMAGE TO ONE HOME AND ROOF DAMAGE TO A BARN. 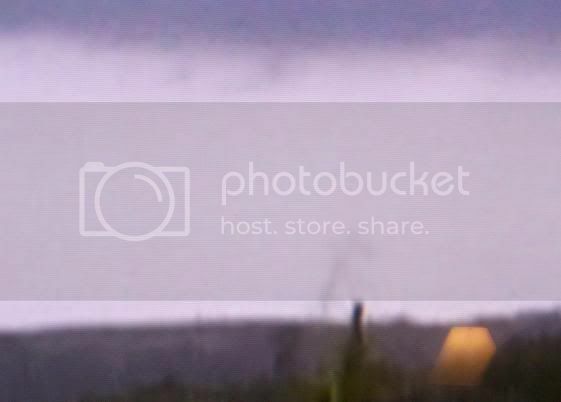 THE TORNADO WAS ON THE GROUND AT 556 PM CST. DALLAS COUNTY (RATED AN EF3): A TORNADO CROSSED THE WILCOX-DALLAS COUNTY LINE ABOUT 6.4 MILES SOUTHEAST OF THE TOWN OF ALBERTA. THE TORNADO TRACKED NORTHEASTWARD AND ENDED ALONG THE ALABAMA RIVER EAST OF THE WHITES BLUFF COMMUNITY. THE MOST CONCENTRATED DAMAGE IN DALLAS COUNTY OCCURRED JUST SOUTH OF FIVE POINTS ALONG COUNTY ROAD 31 AND ALONG COUNTY ROAD 33. TWENTY SEVEN HOMES SUFFERED VARYING DEGREES OF DAMAGE. TWO HOMES WERE COMPLETELY DESTROYED. AT LEAST SIX OUTBUILDINGS WERE DAMAGED. NUMEROUS TREES AND POWER LINES WERE SNAPPED OFF OR UPROOTED ALONG THE PATH. QUARTER SIZE HAIL ALSO OCCURRED WITH THIS STORM AS IT MOVED ACROSS SOUTHERN DALLAS COUNTY. THE TORNADO DAMAGE PATH WAS APPROXIMATELY 15.6 MILES LONG AND 500 YARDS WIDE AT ITS WIDEST POINT. MAXIMUM WINDS WERE ESTIMATED AROUND 142 MPH. ALL OF THIS DATA IS FOR DALLAS COUNTY ONLY. THIS TORNADO STARTED IN WILCOX COUNTY AND WAS THE SAME DEADLY TORNADO THAT AFFECTED THE MILLERS FERRY AREA. THE TORNADO WAS ON THE GROUND IN DALLAS COUNTY FROM 1231 PM CST UNTIL 1248 PM CST. A SEVERE THUNDERSTORM WARNING WAS IN EFFECT FOR DALLAS COUNTY FROM 1207 PM CST VALID UNTIL 1245 PM CST...AND A TORNADO WARNING WAS IN EFFECT FROM 1224 PM CST VALID UNTIL 115 PM CST. THE TORNADO RATING WAS BASED ON THE CONTINUOUS PATH FROM WILCOX COUNTY. AFFECTED THE DAVENPORT COMMUNITY...THE FLETA COMMUNITY...AND...SPRAGUE...AND THE RIDGELAND FARM SUBDIVISION. THE TORNADO LIFTED JUST EAST OF US HIGHWAY 231 NEAR THE CARTERS HILL COMMUNITY. SIX MINOR INJURIES WERE REPORTED WITH THE TORNADO. TWO OF THE INJURIES OCCURRED WHEN AN AUTOMOBILE WAS THROWN OFF THE ROAD OVER 300 FEET. AT LEAST 39 HOMES SUFFERED VARYING DEGREES OF DAMAGE. THREE OF THE HOMES WERE COMPLETELY DESTROYED. AT LEAST 23 OUT-BUILDINGS OR BARNS WERE DAMAGED. FOUR LARGE CHICKEN HOUSES WERE COMPLETELY OBLITERATED NEAR THE DAVENPORT COMMUNITY. ONE HIGH VOLTAGE POWER TRANSMISSION LINE WAS TOTALLY DESTROYED. FOURTEEN GRAIN SILOS WERE DESTROYED AND FOUR OF THE SILOS WERE PICKED UP AND THROWN UP TO 1/2 OF A MILE. AT LEAST 10 AUTOMOBILES WERE SIGNIFICANTLY DAMAGED. HUNDREDS OF TREES WERE SNAPPED OFF OR UPROOTED ALONG THE DAMAGE PATH. THE DAMAGE PATH WAS 26.8 MILES LONG AND 600 YARDS WIDE AT ITS WIDEST POINT. MAXIMUM SUSTAINED WINDS WERE ESTIMATED AT 135 MPH. THE TORNADO WAS ON THE GROUND FROM 248 PM CST UNTIL 326 PM CST. A TORNADO WARNING WAS IN EFFECT FOR LOWNDES COUNTY FROM 220 PM CST VALID UNTIL 300 PM CST. A TORNADO WARNING WAS IN EFFECT FOR MONTGOMERY COUNTY FROM 211 PM CST VALID UNTIL 345 PM CST. Emergency Management Officials surveyed storm damage in the Phenix City area. It has been determined that the damage was the result of a tornado. The tornado has been rated an EF-2 on the Enhanced Fujita Scale. This rating was based on the highest damage along the entire path through Georgia. The damage in Russell County is consistent with EF0 damage and the damage in Lee County is consistent with EF1 damage. The tornado touched down near the Russell-Lee County line in Phenix City. Damage near the touchdown point was very light with only minor tree damage being reported. As the tornado tracked northeastward, it became stronger as it approached Lake Oliver on the Chattahoochee River. The greatest damage was from Summerville Road into the River Oak and Rock Island areas. Numerous pine trees were snapped off and some hardwoods were uprooted. Several homes suffered shingle damage. Some of the fallen trees landed on homes and produced moderate damage. The tornado continued eastward where it produced damage in Columbus Georgia. The total tornado damage path was 10.3 miles long and was 300 yards wide at its widest point. The damage path in Alabama was only 2.4 miles. 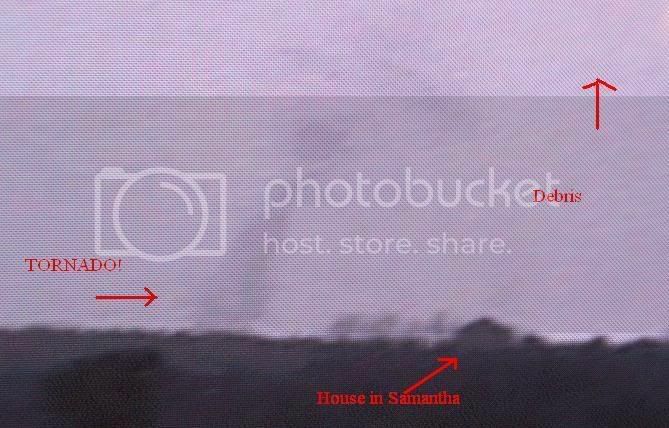 The tornado was on the ground in Alabama from 527 PM CST until 531 PM CST. All of central Alabama was outlooked for a High Risk of Severe Thunderstorms including the chance of violent tornadoes. A Tornado Watch was valid from 945 AM CST until 8 PM CST. See the report from the National Weather Service Office in Atlanta. Click on the images below for larger picture. The National Weather Service would like to thank the Russell County Emergency Management Agency for providing support during the storm survey process. THE TORNADO FIRST TOUCHED DOWN AROUND 1230 PM CST (MARCH 1ST) AT STATE HIGHWAY 28 NEAR MILLERS FERRY DAM. THE TORNADO THEN TRACKED NORTHEAST ACROSS WILLIAM "BILL" DANNELLY RESERVOIR...MOVING ASHORE ON SAND ISLAND AT SAND ISLAND DRIVE. THIS IS WHERE MOST OF SEVERE DAMAGE OCCURRED...WITH NUMEROUS HOMES DAMAGED OR DESTROYED. ONE RESIDENT HAD ARRIVED AT HIS HOME TO EAT LUNCH WHEN THE TORNADO HIT AND WAS KILLED WHEN HIS MANUFACTURED HOME WAS DESTROYED. NEIGHBORS NEXT DOOR HAD SOUGHT REFUGE IN AN UNDERGROUND STORM SHELTER OUTSIDE THE HOUSE SECONDS BEFORE THE TORNADO HIT. ALL THEY HEARD WAS DEBRIS HITTING THE DOOR OF THE SHELTER. WHEN THEY EMERGED THEY SAW THAT THEIR HOME WAS DESTROYED. THERE WERE ALSO TWO REPORTED INJURIES. MOST OF THE HOMES ARE VACATION HOMES WITH PART-TIME RESIDENTS. IF THE TORNADO HAD STRUCK ON THE WEEKEND WHEN MORE PEOPLE ARE PRESENT...THE LOSS OF LIFE WOULD LIKELY HAD BEEN GREATER. IN ALL AROUND 40 HOMES WERE DESTROYED OR DAMAGED ON SAND ISLAND DRIVE...WITH SOME OF THE DEBRIS SCATTERED UP TO TWO MILES DOWNSTREAM. THE TORNADO THEN CONTINUED MOVING QUICKLY TO THE NORTHEAST THROUGH SPARSELY POPULATED TERRITORIES. WHICH RATES IT AS AN EF-3 ON THE NEW ENHANCED FUJITA SCALE. THE LENGTH OF THE TRACK WAS 15.6 MILES LONG...WITH THE WIDEST WIDTH OF ABOUT 500 YARDS. Beginning midday Thursday, March 1, and continuing into the early morning hours of Friday, March 2, 2007, the NWS Weather Forecast Office in Tallahassee issued 57 warnings. These included 35 tornado, 19 severe thunderstorm, and 4 special marine warnings. 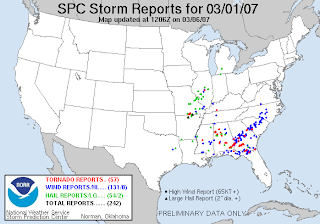 During this time, warnings were issued for two deadly tornadoes, which caused the loss of 15 lives, nine in Enterprise, AL, and six just north of Newton, GA. Figure 1 shows the extent of the severe weather during the event. Preliminary tornado tracks are indicated with charcoal gray ovals. Straight-line wind damage reports occurred within the white rectangles. Following the image is a preliminary assessment of the two deadly tornadoes, and other severe weather that occurred during the event. The deadliest tornado was also the first. A tornado warning was issued by this office at 1847 UTC (12:47 PM CST) for Coffee County including the City of Enterprise, AL. An NWS Storm Survey Team determined that a tornado rated EF3 on the new enhanced Fujita Scale touched down in Enterprise, AL, 18 minutes later at around 1905 UTC (1:05 PM CST). The tornado was first observed on the ground at the Enterprise Municipal Airport. About five minutes after that after briefly lifting, it slammed into the Enterprise High School killing eight students and injuring at least 50. The fatalities occurred when a concrete wall collapsed onto a group of students huddled in the hallway in a crouched position. The football stadium was completely destroyed. There was some debate in the media as to whether the students should have been evacuated before the tornado hit. A look in the parking lot, where several cars had been tossed around, indicates that releasing the students could have been even more disastrous. Figure 2 shows the damage paths of the tornado across Enterprise. Figure 3 shows some of the damage to the high school, courtesy of WTVY-4. Downtown Enterprise was also hit hard with damage to homes on several streets and many roads blocked by downed power lines. An additional fatality occurred. The tornado path was approximately 200 yards wide and 10 miles long. Figures 4 and 5 show the base reflectivity and storm-relative velocity from the Fort Rucker Doppler radar (KEOX) at the time the twister reached the high school. In the reflectivity image, note the blob of high reflectivity just east of the "hook" likely caused by debris. The supercell that produced the Enterprise tornado sped northeast across Dale Co dropping golf ball size hail in Ozark and quarter size hail in Newton, AL. A tornado briefly dropped back to the ground in Level Plains, AL, near CR 1 at around 1925 UTC (1:25 PM CST). This same parent supercell spawned another tornado in northeastern Dale County at Echo around 1950 UTC (1:50 PM CST). A total of 15 homes were damaged or destroyed and four people sustained minor injuries in Echo. The tornado then moved into Henry Co, AL, causing damage around 2005 UTC (2:05 PM CST). Several homes were damaged west and southwest of Abbeville. A tractor trailer was overturned northwest of Abbeville. The tornadic supercell continued on into Georgia, causing more damage in Clay County near and north of Fort Gaines around 2030 UTC (3:30 PM EST) before moving north of the our county warning area of responsibility. Figure 6 shows the approximate damage path of the tornado as it crossed Dale and Henry Counties. Storm surveys have not been completed in this area. It is unknown whether this tornado was on the ground for the entire distance indicated, or whether it hopped along this path. Click here for a loop of radar imagery and warning area polygons as this supercell crossed Southeast Alabama. At about the time this storm exited the area, a series of four supercells can be seen lined up from South Central Alabama east to West Central Georgia as shown in Figure 7 below.